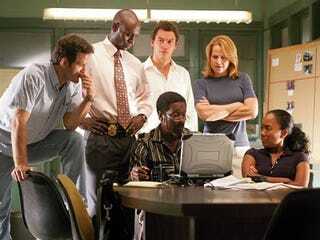 The fictional police task force on HBO's "The Wire." Fresh from our "The pot calling the kettle black" file, The Wire creator David Simon takes Baltimore Police Commissioner Frederick H. Bealefeld III to task for singling out HBO's The Wire for creating a "smear that will take decades to overcome." In an op-ed for the Baltimore Sun, Simon highlighted the disconnect between the Baltimore department's aggressive street-level prosecution of the drug war and the root causes of violence in the city. Simon, a former Baltimore police officer, takes aim at the zero-tolerance policy of minor street crimes after then-Mayor O'Malley's election. He also highlights the police department's obsession with street-level drug enforcement that actually de-emphasized quality police work and led to marked declines in arrest rates for major felonies. Simon added that it was the dubious police work that contributed to the "alienation of the juror pool," with jurors no longer being able to trust the testimony of testifying officers. Ouch. Simon's last blast was when the city engaged in reducing felonies to misdemeanors to show a decrease in crime to aid O'Malley's run for governor, thereby putting the needs and safety of citizens on the back burner. Did we mention that he called them out for violating the civil rights of Baltimore residents? Simon's response gives new meaning to the saying, "When you point your finger at someone else, there are three pointing back at you." Criminal of Great Parent: Black Mother Jailed for Sending Daughters to White School.